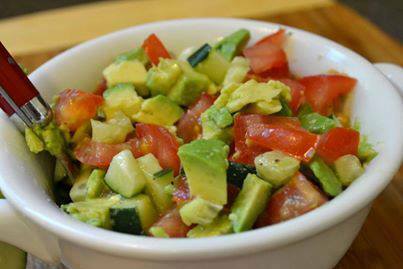 Combine tomato, onion, jalapeno, lime juice to taste, salt and pepper in a medium bowl. Stir in avocado and cilantro. Add cayenne (if using). Per tablespoon: 9 calories; 1 g fat ( 0 g sat , 0 g mono ); 0 mg cholesterol; 1 g carbohydrates; 0 g protein; 0 g fiber; 13 mg sodium; 44 mg potassium.